Partnering with the charity Newlife at the OT Show, Theraposture will be showcasing its pioneering assistive beds and care cots whilst offering a unique competition to Occupational Therapists. The OT Show (26-27 November, Stand E40, NEC). Theraposture is a family run business established in 1981, which is the preferred choice of many OTs recommending power-adjustable beds, chairs and care cots to clients requiring mobility assistance at home. This Wiltshire-based specialist supports the whole UK with trusted solutions and ethic assessment procedures that ensure vulnerable individuals can remain independent and avoid expensive care costs. It is a long standing supplier to the Newlife Foundation which is a charity dedicated to providing essential, supportive equipment to children with disabilities and life-limiting conditions. Theraposture works closely with the charity to ensure positive outcomes for disabled children and their families – hence the two organisations are exhibiting together at the OT Show. 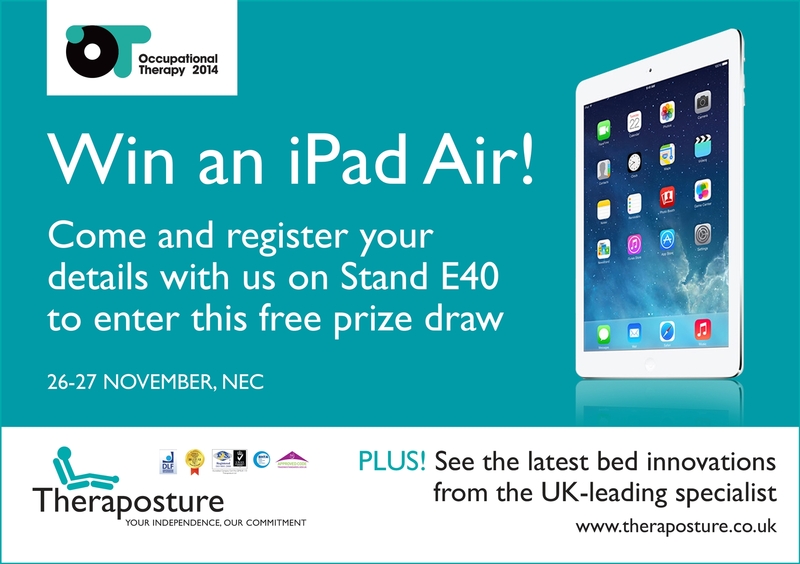 In addition to meeting senior representatives from Theraposture and Newlife, all OTs who visit stand E40 can be entered into a free prize draw to win the latest iPad Air tablet from Apple. This high value prize will be available to all visitors alongside free information regarding the Theraposture range of pioneering products. These details are essential for OTs when compiling client assessments and reports for case managers. Highly experienced Theraposture Assessors will be on hand throughout the exhibition to explain how their products deliver trusted independence in the community. In terms of product, the Theraposture showcase this year will include the revolutionary Mascot Mk2 care cot and a highly respected double combination Rotoflex bed in oak. The latest Mascot is the first fully modular cot design in the UK and provides complete flexibility to meet the changing needs of a disabled child. It is a ‘future-proof, whole life’ solution that eliminates the need to purchase and specify new cots if care requirements develop in the future – the most cost effective concept ever. Theraposture’s Rotoflex bed truly delivers independence, as it is a real alternative to hoisting and carer assistance. In this situation the bed can pay for itself many times over as the cost of care at home or in a residential setting is so high. The Rotoflex can be electrically operated to rotate and move the user from a recumbent position to a seated position, ready for a standing transfer. It can be specified as a single bed or part of a double combination so partners with varying mobility difficulties can still sleep together. In addition to its smooth and controlled rotational movement, the Rotoflex provides powered profiling and variable height function and can be fitted to either side of a double bed.